It was a dark and stormy night, with all the clichés that implies. A young married couple, Mark and Kathy, charter a plane to fly them to a hospital for the birth of their first child, which is about to happen at any minute. Why are they flying now? Because apparently they live somewhere without a hospital, and they didn't have the foresight to travel ahead of time. Or maybe the baby is coming early. Whatever. The details aren't important. Dark and stormy night, girl's about to pop, weather's really bad for flying. Got it? OK.
Turbulence! Zero visibility! Radio can't make contact! The pilot is forced to land on the first well-lit patch of asphalt he sees. But where are they? It's a street, near a town, and the town is… well, it's wacky. The people all act like they're stuck in a trance. Each says and does the same things over and over in a loop. The town itself looks like a movie studio backlot. It has a Western saloon next to a New York subway entrance (that leads nowhere) and the Lincoln Memorial. The day-old newspaper is from Baltimore. Nobody will tell them where they are or help them at all. This place is kooky, man! After the baby is born, Mark, Kathy and their hothead pilot decide to get the heck out of Weirdsville. They commandeer a truck and drive about twenty miles before running into an invisible barrier. It's like a giant glass wall, but much stronger than glass. They can't break through it or go around it. It circles the entire town, even above. It's a dome, and they're trapped under it! I bet Stephen King is a big fan of this movie. Will Mark and Kathy get out of town? Will the mystery of the dome be explained? Will any of this make sense? Honestly, don't get your hopes up. You don't watch a movie like 'The Bubble' expecting a compelling story, richly-drawn characters or intellectually stimulating ideas. This 1966 B-movie exists for only one purpose and has precisely one redeeming quality: It's in 3D. We're talking old-school 3D here, not the pale imitation of it you see in multiplexes today. Modern filmmakers, even the ones who genuinely like 3D and aren't just forced to use it by a studio, are so timid with it and so terrified of their movies being labeled "gimmicky" that they're afraid to extend 3D depth more than a quarter of an inch in any direction. That's not the case with 'The Bubble'. Ads for the movie repeated the mantra, "The picture floats off the screen!" Indeed, the first shot is a side view of an airplane, its wing extending way out into the middle of the viewing room. This is an unabashed gimmick movie with aggressive, poke-you-in-the-eye 3D throughout. If you're into that sort of thing, it's great fun. As a movie, though…? The acting is across-the-board embarrassing. The direction is clumsy and poorly-paced. The story is a bunch of sci-fi hokum cobbled together from pulp novels and 'Twilight Zone' episodes. The plot is full of holes and frequently incoherent. The dialogue is atrocious. The director, Arch Oboler, was a radio personality of some moderate fame in his day, a showman, and an enthusiastic fan of 3D. He'd previously directed 'Bwana Devil', the movie that kicked off the first big 3D craze of the 1950s. By 1966, the 3D fad had long since waned, but Oboler was determined to bring it back with a new process dubbed "Space-Vision 3-D," which made 3D cheaper to produce and easier for theaters to project. Unfortunately, aside from the technical aspects of 3D, Oboler's grasp of filmmaking was rather rudimentary. Responding to complaints that the film's original 112-minute length was too slow and talky, Oboler cut nearly twenty minutes out and destroyed the extra footage. The existing shorter cut (re-released in 1976 with the new title 'Fantastic Invasion of Planet Earth') is extremely choppy. It has many obvious gaps where the narrative lurches forward without explaining what happened between scenes. It also doesn't have an ending. I don't mean that it has an anticlimactic or disappointing ending; I mean that the movie just stops after a random scene and doesn't resolve anything. For all that, it's still decidedly too slow, dull and talky. Does any of this really matter? As I said, a viewer who watches 'The Bubble' is really only interested in getting a fun 3D experience, and on that count the movie delivers. This may not be high art… or even middle-of-the-road art. Oh hell, it looks up with aspirations to be below-average art. Whatever it is, the film has its charms. 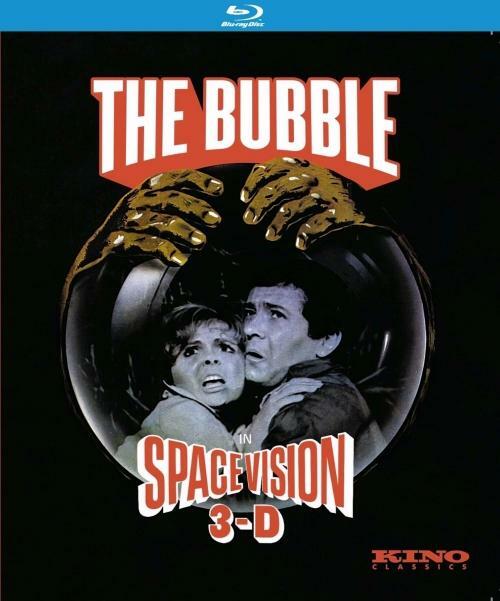 After 'Dragonfly Squadron', 'The Bubble' marks the second restoration of a vintage 3D B-movie by the 3-D Film Archive. While the earlier disc was distributed on Blu-ray by Olive Films, this one comes from Kino Classics. The Blu-ray for 'The Bubble' contains both 2D and 3D versions of the movie on the same disc, selectable from the menu (which is also 3D). To my knowledge, the film has never been released on DVD. Early 3D movies of the 1950s photographed the left and right eye views on two separate strips of film, which then had to be projected in theaters using two projectors in perfect sync. The process was prone to technical failure on the display end. If one of the prints lost a frame at a splice, the two projectors would lose sync and the image would be unwatchable for viewers. This was one of the reasons the 3D craze of that decade died out rather quickly. By the 1960s, a new solution was required if 3D were to make a comeback. With 'The Bubble', director Arch Oboler debuted a new process he called "Space-Vision 3-D" which combined both the left and right eye views onto a single frame of 35mm film, one on top of the other, each half the height of a standard image. Release prints could also be played back through a single projector, eliminating the complications of syncing two projectors. The reduced height of the over/under format gave the picture a widescreen aspect ratio conveniently compatible with CinemaScope. However, because it used so much less area on the 35mm frame, this resulted in a soft and very grainy image when blown up for theatrical projection. Nevertheless, because it was so much more convenient and economical than two-camera 3D, variations of the over/under format were employed (using a host of different names) for the 3D revivals of the 1960s, '70s and '80s. Needless to say, 'The Bubble' was never exactly a crown jewel in any studio's catalog. In addition to the inherent limitations of its photography, the film elements had been badly neglected and left to deteriorate over the years. In restoring it now, the 3-D Film Archive repaired or digitally erased some of the worst splice lines and physical damage, but the firm is a small outfit working with a limited budget and could only do so much. The missing footage is long since gone, and what remains still has very prevalent dirt and scratches throughout. The Blu-ray's 1080p/MVC MPEG-4 transfer is presented at a very wide 2.55:1 aspect ratio. It's a little drab and faded, with elevated black levels and lots of grain. The picture isn't overly sharp, but it's detailed enough to expose the wires in some special effects shots. The restoration notes claim that this is the best 'The Bubble' can be made to look, and may even be the best it has ever looked. Although I have no reason to doubt that, the problems still stand out. I can't imagine why anyone would want to watch this movie in 2D. If you did, I'm sure it would be tremendously disappointing. Fortunately, the 3D aspect is the saving grace here. Almost every shot in the movie is framed for maximum, often exaggerated 3D depth behind and/or in front of the screen, sometimes to the point of distorting the perspective. A close-up of a character lying in a hospital bed looks like her pillow is five feet from the wall. The parallax is so wide that it may cause discomfort in some viewers. However, when it works, which is most of the time, it's hugely fun. A fireman's ladder swings right out over your head. A worker plastering a billboard shoves his broom directly into your face. A drink tray in a bar magically (without any explanation at all) levitates out of a character's hand and floats way out towards you, seemingly within reach. If you've lamented the lack of pop-out effects in modern 3D films, you'll find them in full-force here. With the very first shot of the movie, I exclaimed, "Now THAT'S 3D!" The restoration team may not have been able to do much about some of the other picture quality issues, but the left/right 3D alignment was painstakingly corrected frame-by-frame, and that aspect of the disc is a true marvel to behold. I don't have nearly as much to say about the disc's audio. The DTS-HD Master Audio 2.0 mono soundtrack is… well, it's listenable. The dialogue is very flat, but you can understand most of it without straining. So, that's a point in its favor. The theremin score is a bit shrill, but never so bad that it's unforgivable. The movie has a very simplistic sound design. It has dialogue. It has some music. And it has sound effects when an action on screen specifically requires a sound effect. Don't expect anything fancier than that. The recording quality is dated, but that shouldn't be a surprise for a movie like this. Because 'The Bubble' has never been released on DVD, just on Blu-ray, all of its bonus features will be listed and graded in the next section of this review. I can't defend 'The Bubble' as a great, or even good, movie. Frankly, it's terrible. Perhaps appallingly so. It's a mess of amateurish acting, inane writing and incoherent storytelling. However, it's a super-fun 3D experience, from a time when 3D wasn't afraid to reach out off the screen and smack you in the face. This Blu-ray will be of no interest at all to casual moviegoers. But if you're a 3D fan and your home theater is equipped to show it, the disc is worth a look.